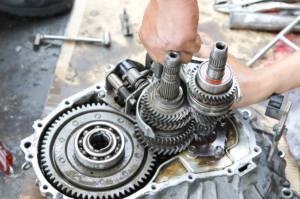 Should You See an Elmhurst Transmission Repair Company? Should You Utilize the Services of an Elmhurst Transmission Repair Company? Without a properly functioning transmission, your car will likely not survive for very long. It’s for this reason that you should keep your transmission’s health in mind. Should something go awry with your transmission, it’s wise to take it to a transmission repair company immediately. However, how can you tell when something has gone awry with your transmission? Are there specific signs which indicate that you should utilize the services of an Elmhurst transmission repair company? To put it simply: yes. If your answer to any of the following questions is ‘yes’, it’s highly recommended that you see a transmission repair company as soon as possible. Is Your Transmission Fluid Black? To check your transmission fluid, first pop the hood and lay your eyes upon your transmission. When you find it, pull out its corresponding dipstick. What color is the fluid on the dipstick? If it’s dark brown or black, you’ve got a problem. When transmission fluid becomes old and overused, it starts to char, taking on a burnt and black appearance. Ideally, your transmission fluid should have a light red color. If your fluid is, indeed, black, it’s best to have it flushed and replaced. Does Your Vehicle Emit a Burning Aroma? Do you smell a burning odor when in close proximity to your car? If so, there is almost certainly something wrong with it. In many cases, your transmission fluid can be the cause of this odor. When transmission fluid becomes overused, it also becomes burnt, emitting a rank and smoky aroma that is almost impossible to miss. What can you do to get rid of this odor? Get rid of your burnt transmission fluid and replace it with fresh transmission fluid! Do Your Gears Shift Slower Than They Once Did? Imagine you’re driving down the road, accelerating in an attempt to keep up with traffic. Everything’s going fine until . . . your car jerks. You instantly know something is wrong, but you don’t know what. More often than not, the problem lies in your transmission. When a transmission is impaired in some way, it will shift gears more slowly than it once did. This will sometimes cause your car to jerk suddenly. How can you fix the problem? Either with new transmission fluid, or with a mechanical repair of your transmission itself. Is Your Vehicle Making Strange Noises? When driving your vehicle, you should also keep your ears alert for strange noises. Odd noises can come about for a variety of different reasons. If you’re hearing a gurgling, whistling, or grinding noise on a regular basis, your transmission could very well have a problem. Depending on the problem, a fluid change, a transmission repair, or a transmission replacement could be needed. Are There Unusual Leaks Under Your Vehicle? Do you often notice any fluids on the ground underneath your car? If so, your car has a leak in one of its components. Depending on what fluid is leaking, this could be either a huge problem, or no problem at all. If the fluid is light red, it’s probably coming from your transmission. This is a bad thing. If your transmission fluid is leaking, your transmission will not be able to run as intended. In these cases, it’s recommended that you take your car into a repair mechanic immediately. Do any of the above signs ring true to your car? Looking to utilize the services of a reputable Elmhurst transmission repair company? If so, we here at King Transmission Company have you covered. We’ve been serving the Elmhurst area since 1954 and have fixed thousands of transmissions over the years. We look forward to fixing your as well.